Discover how Hitachi Vantara can help you create a successful compliance strategy. • Provide flexibility, extensibility and scalability through a unified data integration and analytics platform. • Offer comprehensive support for a broad set of roles, use cases and data types. • Help users analyze market risk, evaluate intricate financial instruments and uncover possibilities for future investments. • Improve customer experiences to reduce costs and drive new revenue streams. 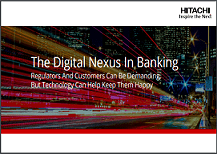 44 of the top 50 global banks rely on Hitachi’s expertise to manage their complex enterprise data. Read the e-book to learn why.